There comes a moment in every webmaster’s career when the proverbial planets seem to align. A moment when the standard cavalcade of “what ifs,” “yes, buts,” and “if/thens” that claw at the soul of any self-aware web marketer are, however briefly, appeased. For this humble webmaster, that day came April 1st, 2013; a day for fools, some say. It started as a simple gag designed to target what I assumed at the time to be a very niche set of potential readers and influencers. I wasn’t expecting much more out of the prank beyond a few chuckles from those who were already within our modest sphere of influence. But April Fool’s Day was fast approaching, and after several revisions and second guesses, I just went for it. These notes are the impetus of the takeaways I’m about to share with you all, the SEOMoz community. At the risk of turning this into a 2,500 word humblebrag, I’m going to refrain from rambling off share numbers or listing all of the links we amassed that day. If we get hung up on those, neither of us will benefit on our next endeavor. As a fatalistically future-oriented personality, I figure what would be most valuable to you are the high-level strategy lessons that I’ll be taking with me forevermore. Here are a few items to consider when putting together a piece of content that you think has the potential of going viral. You’re planning something big, aren’t you? This piece of link bait is about to redefine the meaning of the word "viral." Sometimes web creators can be guilty of over-planning, while other times we’re sorely lacking a real plan at all. I’d tend to err on the side of the former rather than the latter, but we all know that time and personal energy are finite resources. At a minimum, here are a few things I’d have in order before I took another swing for the fences. Get it done early. This gives you time to have others you trust give you their opinions. Allow yourself several nights to “sleep on it” to make it tighter, catchier, funnier, more relatable, etc. Good things come to those who value think-time. Pick your targets. Who might link to this? Which user persona might share this? Thinking about this ahead of time will help you shape your piece. Have influencer’s contact info on standby. Find out if it’s already been done before. No one likes a re-post. Well, except Reddit. Give it the "Golden Test’ of social media. Would you share this with your friends, family, or co-workers? If the answer is no, then go back to the drawing board and make it so. Like wind to a sailboat, it is surely possible for a skilled sailor in command of an amazing machine to prevail against the will of the wind. But even an experienced mariner would see more success with more favorable gales. The success of the Game of Thrones April Fool's joke can be largely attributed to timing. 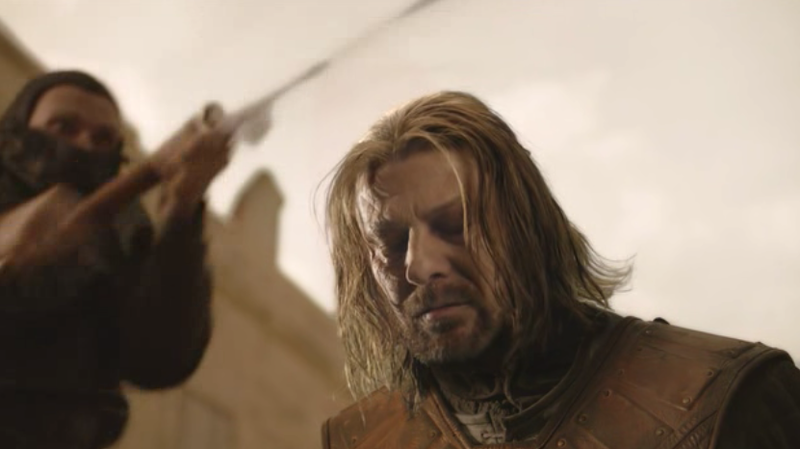 The season premiere had just aired the night of March 31, and the bleary-eyed Knights of Westeros just weren’t prepared for a heart-crushing April Fool's joke on their Facebook feed the morning of April 1st. Hopefully you’re intimately familiar with your own industry enough to understand when the moons might align for your piece of content. Every journey begins with a single step, and every piece of viral content begins with a single share. You all know all of that “relationship building” Distillers and Mozzers have been annoyingly harping about for the past few years? Now is your chance to cash in. I sent an email out to a handful of other webmasters in the Game of Thrones community letting them in on the joke and asking kindly for a share. These are real relationships with people that we respect and that have built over the years, so your mileage may differ. However, if you’ve really got something worth sharing, I think you’ll find that your closest contacts will come through for you. Maximize your own relationships and try your hand at making some new ones. It often only takes a single influencer in the right position at the right time for something to spread like wildfire. I am not a cruel man. When I decided on this particular prank, I was fully aware of the angst and rage it would elicit from a community that I consider myself to be very much a part of. I decided that the article couldn't just be a straight up lie which read like a genuine news story. I had to give a few clues along the way so that anyone who really thought about it would see right through it as an April Fool's day joke. "The producers also noted that, in an effort to maintain continuity, Warwick Davis’ face will be digitally transposed over Mr. Dinklage’s in all future releases of Game of Thrones on DVD and Blu-Ray." "We felt that Warwick’s experience and star power was well worth the investment,” Weiss said. “We’ll be seeing a lot less of the dragons and direwovlves due to the new budgeting that will have to be done to compensate. But in the end, it’s a small price to pay for this kind of acting gravitas." If you believed those zingers, I've got some text link slots available on whitehouse.gov that I'd like to sell you. There were several other troubling discrepancies, as well. I'll give a few passes to those whose first language isn't English. But as for the rest of you? No. Lesson learned: a certain percentage of the human race will not read beyond the fold. A smaller percentage won't even read beyond the headline. We already take great care in crafting headlines, but this little social experiment reaffirms the obvious for me. Just something to keep in mind. While the joke received nods from the likes of Huffington Post, Vanity Fair, and Mashable, these links passed a surprisingly slim amount of traffic back to the site itself. I know you’re all rocking IDIFTLJ tattoos (I Did It For The Link Juice). I am aware of the benefit stemming from these links beyond direct referrals. But I was personally surprised to see that most visitors came from social networks and not the heavy-hitting publications with literally millions of subscribers. Take a look at the top 15 referrals to the article and note the differing visit durations, bounce rates, and pages per visit (organic traffic edges them all out). When another article mentions your piece in reference, the user treats it as such. They might click on it for verification or to curb their curiosity, but ultimately, they’re just looking to get back to their original “Top April Fools Jokes of 2013” list which was the article they were reading in the first place, or they’ll simply settle for the linking publication’s description of your piece. The virility doesn’t stem from the traffic entering via a link from The New York Times (a common misconception, I think). That exponential, explosive power comes from the users who share your piece from there. And a percentage of those readers will be influencers who may link again from there. The copy-cat effect is truly impressive particularly in the "entertainment news" niche. The lesson here is that, in addition to being linkable and referenece-able, your content also needs to be shareable in order to go viral. As powerful as a link from a major newspaper might be, it will never get you the eyeballs (and potential life-long readers) that a social powerhouse like Facebook will. I have a working theory on Facebook and how its power to push content is vastly superior to other social networks. If you look back at the list of referrals, Facebook traffic cleanly decapitates any other social network. And this isn’t for lack of diverse social connections by the content creator. The post was shared on our Google Plus page with over 13,000 encircled and also tweeted to our 20,000 twitter followers. Compared to the (at the time) 3,000 Facebook followers, do a bit of math and you’re starting to see the real relative value of a single Facebook fan vs a Twitter follower. I think this has to do with the way Facebook is integrated into our lives. As marketers and web-savvy individuals, we all have our Tweet Deck’s fully loaded with our Google Plus and Facebook notifications, causing our phones to buzz all day long. But the average user with a Twitter account probably checks their account most often when they’re getting notifications and may rarely take the time to check a finely-tuned feed. The average Google Plus user? …well. Compare this with a Facebook user. She might check her phone/tablet/desktop feed several times a day for updates from people she actually knows – family, friends, and coworkers. A share on Facebook is not only more visible to friends and fans, but is also perceived as much more of a personal endorsement from the sharer. I’m sure others (myself included) have had great success on both Twitter and Google Plus, so this point is debatable. But the relative size of Facebook absolutely isn’t. The potential to go viral on Facebook, or at the very least the boundaries of that success, are simply more impressive on Mr. Zuckerberg’s social platform. This all feeds upon itself as well, because after the dust settles and you’re counting your pageviews, dollars, and new Twitter, Facebook, and Google Plus fans, you’re going to get much more residual value out of those 3,000 new FB page likes than you will with the same number of Twitter followers. I think part of the reason this particular piece worked so well on Facebook is because users were apt to share the joke in an attempt to trick their own friends, which is a process that works much more smoothly on Facebook. Design content that’s packaged with a shiny red bow and ready to be shared with real people. No matter your perceived initial success, there is always room for more outreach. Sure, I could have kicked back and watched the links roll in on Linkstant (which I most certainly did). But with content that has an expiration date, you’ll want to break out that little black book of contacts. One of the most common link-types this article picked up were “Top April Fool's Jokes of 2013.” These began going live as early as 8AM on April 1st. Some of them included our link, while others didn’t. I sent out a dozen or so emails to various authors with a link to our post asking for consideration. Several of them obliged and thanked me for the submission. You could also, again, utilize your current relationships by pinging contacts you’ve touched base with before. Not all traffic is created equal. A user who does a few refined searches and eventually lands onto your page for the correct answer to her query is much more likely to “convert.” Whether that means signing up for a mailing list, purchasing a product, or clicking on advertisements, these visitors are not really “on the hunt” for content in the same way a search engine visitor might be. These visitors have simply been referred to the site through Facebook, Reddit, or some other site that has not qualified the user as needing your services the same way Google’s algorithm might. Literally and figuratively: they’re much more likely to bounce. I recently wrote about AdSense basics on the Distilled blog, but for those wondering: CPC (cost per click) also took a hit for the following week as the AdSense algo wasn’t very happy about the reduced CTR. Google most likely wanted to protect advertisers from what it interpreted as a drop in qualified/convertible traffic. Viral visitors bounced at a much higher rate as well: ~91% for the April Fool's article vs a ~60% site-wide average. I’d expect e-commerce sites to see similar results from viral traffic (if not worse). So, in some ways, it is mostly about the link juice and brand exposure. Is your server ready for 1,000,000 visitors today?! You’d think that my little site would have been crushed under the stampede of exposure, but just weeks before, I had clairvoyantly set up a CDN with Amazon’s CouldFront. This took most of the weight off of our main server and delivered content more quickly for international readers. I was feeling great about myself. My Google page speed score shrugged at 1 million visitors like so much dirt off of Jay-Z’s shoulder. And then I checked my CloudFront bill…two days later. Considering that a normal day of CloudFront usage for us is about 80 cents, I was shocked at first (see picture above for actual facial expression). But then I started doing the math…if a “normal day” sees about 30,000 visitors and this day brought about 1,000,000, then this day should cost about 33 times more than normal. Needless to say, 33 X $0.80 should have left me with about $30 in overage charges. Something didn't feel right. So to my dismay, I went back to the page itself and checked the image file sizes. For some reason, I’d forgotten to downsize the images within the article itself, so that these were each 250KB (!!!) each. Needless to say, they could have easily been (and now are) 25KB each, a rookie process I nearly always implement…on every article aside from this one. In the end: a splendid $100 lesson learned, I guess! But more than that, I get to share that lesson with you all who will hopefully avoid the same mistake in the future. For those especially concerned about this, check out the WordPress plugin Smush.it. I also can’t recommend Amazon’s CloudFront enough (in spite of the nasty bill above). They charge only for what you use, so most sites would see major speed increases for pennies a day. I have no doubt that the site would have simply gone down had it not been on a CDN. I've seen a huge decrease in page timings, more pages per visit, and lower bounce rates after switching to a CDN. Set it up and just leave it off when you're not in need. You can always switch it back on as the storm approaches. Just ask Ser Barristan. At the end of the day, there is always an element of luck underlying any great venture. What if a different Mashable editor were on staff that April 1st? What if that "just one" influencer mentioned above called in sick? There are several variables at play that are out of your control. But this isn't necessarily an excuse for failure. On March 31st, I was very nervous about launching this April Fool's article. How would the mainstream media react? How would George RR. Martin feel about it? Would my readers come for my head? Is this even funny? I was very close to pulling the thing, to be honest. But at the end of the evening, I logged in and scheduled the post for 1AM, April 1st. In my experience, fortune seems to favor those who take chances. "Luck" comes to those who do things that aren't completely, 100% guaranteed to work. If there were zero risk to what you were doing and it were as easy as putting together a blog post, then someone would have done it already. The barriers to entry on content are so low these days that sometimes content creators just have to be brave to get noticed. Bravery on your part also helps ensure that your competition can't easily duplicate what you've done. At the end your day of 1 million visitors, it’s tempting to kick your feet up, count your earnings, and sip away at that frosty Miami Vice you've surely earned. But don't get too comfortable. Your brand is now on the radar of several major news outlets that you may have even spoken to personally (see the outreach section above). Your social network ranks may have swelled, indefinitely giving you more exposure for your future works. People are listening now, and much is expected of you. Now may be just the time to make even more bold moves. This isn’t a post about “how to get one million visitors in a single day.” I find those to be about as helpful and genuine as posts about “how to make a million dollars in a single year.” This is an anecdotal post about how it happened in one very specific instance. But hopefully you’ve been able to glean a nugget or two of enlightenment that will save you some time and effort in the future…or just net you a bit more beer whiskey money. Oh, and my sincerest apologies to anyone who may have had their day/week/life ruined by the April Fool's joke. It was a very Joffrey Baratheon thing to do. Seven save me. Need further recompense? AMA below.